Liverpool and Chelsea continued their fine start to the 2018/19 Premier League season with victories over Tottenham Hotspurs and Cardiff City respectively. Week five also saw Arsenal, Manchester United and defending champions Man City win their respective fixtures to move up the table. Elsewhere, Everton suffered their first loss of the season, going down 3-1 at home to West Ham United who registered their first points of the campaign. It is still early days but Burnely are already looking a good bet for relegation as they succumbed to a 1-0 loss at Wolves, their fourth of the season. GK: David Da Gea (Manchester United). Tottenham’s Michel Vorm may have made the most saves this weekend but after two costly errors, i thought i should go for United’s David De Gea. It has not been the best of starts for the Spaniard this season, conceding in four of his first five games but it was down to his reflexes that United managed to win all three points in a fairly hard fixture away to Watford. The save to deny Christian Kabasele deep into injury time was the deal breaker for me and De Gea makes it into my team of the week for the first time this campaign. CB: Chris Smalling (Manchester United). 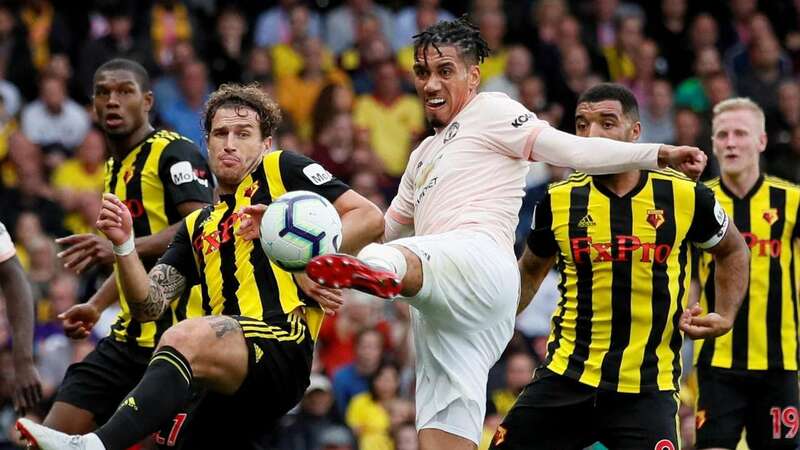 Let’s forget his hair cut as it is a bit over exaggerated to me, Chris Smalling had an outstanding display as United scrapped past Watford on Saturday evening. Solid at the back against two powerful and fairly quick strikers in Troy Deeney and Andre Grey, he looked a class apart and scored the all important second goal that proved to be the winner. At a period when Jose Mourinho looks for stability and continuity, he can surely back on Smalling for the meantime, at least. The Englishman has now ended up on the winning side in all 11 Premier League games in which he has scored, the joint-best such record (with former Liverpool forward-Ryan Babel). Dejan Lovren must be cursing the day he got injured in the build up to this season because it will be extremely difficult for him to get back into the Reds’ starting line-up and it is all down to a certain 21 year old by the names of Joseph Gomez. The young Englishman continues to impress as Van Dirjk’s partner at the heart of Liverpool’s defence and on Saturday, he almost but sealed his spot in the starting line-up. Against arguably the best striker in the League-Harry Kane, Gomes marked his fellow Englishman out of the game as the Spurs forward resorted to speculative efforts and also bailed out his senior-Van Dirjk on several occasion. CB: Aaron Wan-Bissaka (Crystal Palace). What a player Wan-Bissaka is turning out to be for Palace this season! Already some pundits’ revelation of the season and he continues to impress. Yes Wilfred Zaha scored the winner against Huddesfield on Saturday but i couldn’t help but admire the industriousness and tenacity of 20 year old Bissaka because after all, he layed the bench mark for his team’s success as he ran up and down the pitch, making vital interceptions and if it wasn’t for some poor finishing from those in front of him, he could have easily walked home with an assist or two to his name. One of the players who have faced the ruth of the post Arsene Wenger error. Xhaka has already come under scrutiny despite playing only five games in the new season but on Saturday, he scored a beauty of a free-kick to set the tone for Arsenal’s 2-1 victory at Newcastle United. It may not be his finest performance in a Gunners’ shirt but one his new manager will surely be proud of and one that breathes a sigh of relief in Xhaka too. Wijnaldum has benefited immensely in Klopp’s decision to bench team captain Jordan Henderson and he keeps on vindicating his manager’s choice of starters. Against Spurs on Saturday, he was all over Mauricio Pochetino’s men en route to scoring the first of Liverpool’s two goals. He is clearly not surrendering his starting role easily at Anfiled and both Henderson and new signing-Fabinho will have to work hard to displace the Dutchman. MF: Ryan Fraser (AFC Bournemouth). Ryan Fraser had a hand in three goals in a single Premier League game for the first time-against Leicester on Saturday. Apart from Hazard, the 24 year old Scot was the only other player to be involved in three goals this past weekend and that places him in my team of the week automatically. If he can replicate Saturday’s form in 10 or more games for his side this season, relegation may be least of their worries. MF: David Silva (Manchester City). When Kevin de Bryne got injured last month, everyone knew that it was now down to David Silva to pull the string for City and he has done exactly that. Against Fulham on Saturday, Silva scored his 50th Premier League goal, becoming the fifth player to do so for Manchester City, the others being Sergio Aguero, Yaya Touré, Carlos Tevez and Edin Dzeko. With Hazard in such form, everyone in the Premier league should be worried because once he is on song, Chelsea always win the league. Five games into the season, Hazard has already scored as many goals and assisted two goals and already the most outstanding players in the eyes of the majority. Three of those goals came against Cardiff on Saturday as Mourizio Sarri’s men were required to come from a goal down to win 4-1 at the Bridge. FW: Andre Yamalenko (West Ham United). West Ham had endured their worst start to the Premier League in their history until Manuel Pellegrini decided to hand Andre Yamalenko his first start in a Hammers’ shirt. 90 minutes later, the Ukranian had scored two of West Ham’s three goals as they registered their first points in the league. His place in my team was not safe though as another Hammer in Marko Arnoutivic had a scintillating display but had to go for Yamalenko in the end. FW: Joshua King (AFC Bournemouth). Struggled to find a suitable out and out striker to shape my team and in the end, decided to settle for Bournemouth’s Norwagian international-Joshua King. His goal may have come from a penalty but the 26 year old also managed to assist one of Ryan Fraser’s two strikes in the 4-2 win over Leicester City.